More than 1,500 people in the Mekong Delta city of Can Tho took part in the third International Yoga Day on June 17. The mass yoga practice is part of the series of activities to mark the 45th anniversary of diplomatic ties between Vietnam and India and 10 years of their strategic partnership. Addressing the event, Vice Chairman of the municipal People’s Committee Le Van Tam said it is a people-to-people exchange activity that aims to boost mutual understanding between Vietnamese and Indian people. Can Tho and India have worked together in various projects in agriculture, information technology, and human resources training, he said, wishing for more joint cultural exchanges between the sides in the future. Can Tho hopes to welcome art troupes, investors and tourists from India, the official stressed. Smita Pant, Indian Consul General to HCM City, said yoga is a key to a healthy and balanced body and mind. 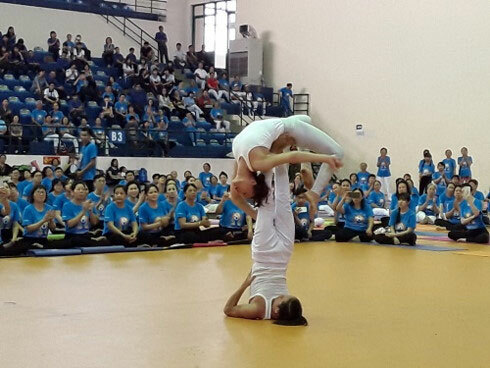 She said she hopes the day will help increase the population of Yoga practitioners in Can Tho. The event is scheduled to run in Hanoi, Vinh Phuc, Vinh, Da Nang, Nha Trang, Long An, Can Tho, and Dong Nai from June 17 to July 2, and finally reach Ho Chi Minh City on June 25./.